The Joint Land Use Study (JLUS) is a program to create a participatory, community-based framework for addressing land use issues around military installations. The objectives of the JLUS are two-fold: to encourage cooperative land use planning between military installations and the surrounding communities; and to seek ways to reduce the operational impacts of military installations on adjacent land. The Fort Campbell region was an early adopter of this coordinated approach to planning around military installations. 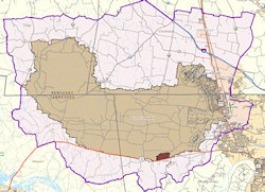 In 1996, the Army and participating local governments completed a JLUS for the surrounding four-county area of Montgomery, Stewart, Christian and Trigg Counties. Members of the Fort Campbell JLUS Partnership joined in initiating this effort to build on the 1996 study by revisiting current development issues, growth trends, and evolving mission needs and strengthening planning practices at the military/civilian interface. While encroachment is currently not severe in all areas around Fort Campbell, changing market conditions, population growth, and increasing commercial activity are quickly reshaping development patterns near critical training operations. The JLUS is at its most effective as a proactive process for identifying and minimizing these foreseeable threats to military readiness, public safety, and regional quality of life. Craig Morris is a member of the JLUS Technical Coordinating Committee, and the PADD Point of Contact for this effort.